World of Goo is a wonderfully crafted puzzle game by 2D Boy, an independent game developer consisting of Kyle Gabler and Ron Carmel, both former EA employees, which has won a number of awards for technical innovation and excellence at all levels. Watch this really beautiful intro video of this cute little game called World of Goo. Here is official explanation of World of Goo. 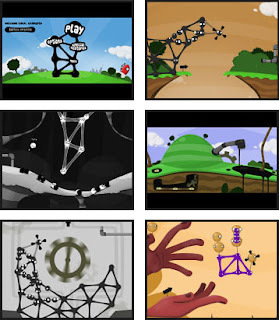 'World of Goo is a physics based puzzle / construction game. The millions of Goo Balls who live in the beautiful World of Goo don't know that they are in a game, or that they are extremely delicious'. Really intriguing isn't it. I can assure you, this is one game in Linux I am so satisfied with. Be it the smoothness of its physics engine or its light weightedness, this is the best I had in Linux for a long time. There is a demo version of the game available for download for free. Get it NOW! If you want to buy this game, here is the link.